The makara is an auspicious aquatic monster, symbolizing water and fertility. It is shown with gaping jaws and protruding forefeet, while its tail becomes transformed into curling vegetal scrolls typical of Gupta art. 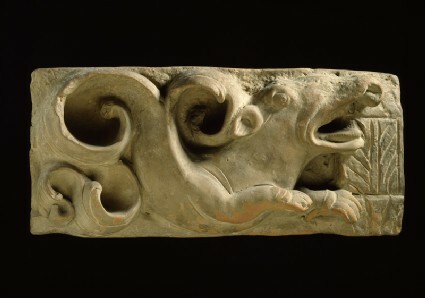 This vigorously modelled relief formed part of a frieze from a temple. The makara, a half-aquatic monster, is perhaps the most frequent depicted fabulous animals in Indian art. This relief formed part of a frieze on one of the innumerable brick temples, of which only a handful have survived, built during and after the Gupta period in northern India. Not only were the niches filled with large, nearly life-sized reliefs of the principal deities, but the upper storeys were thronged with figures, some fanciful like this one, some even humorous, amidst the moulded brick architectural motifs. Brio is one of the characteristics of the larger Gupta terracottas such as this one. Modelled with great freedom, the artist has managed to convey in clay the aquatic, almost slimy, texture of the beast’s paws and snout; whereas the rear portion transforms itself, without the slightest awkwardness in the transition, into the great curling vegetal scrolls which are one of the glories of Gupta sculpture, both in stone and terracotta. The high relief and “lateral” cutting are one of the hallmarks of the style at its pinnacle.